For many travelers the question isn’t if you’ll be traveling or when you’ll be traveling. It’s a matter of where you’ll be traveling. Where do you want to go on your dream vacation? Where should you spend your beach getaway to relax after a hectic month at the office? Where will you be taking that once-in-a-lifetime family trip? If you’re reading this, you probably already know where you’re going: Destination Morocco! For over 1200 years, the Al-Qarawiyyin Mosque (or al-Karaouine) has been one of the leading spiritual and educational centers of the Muslim World. With a history dating back to the 9th century, this mosque and university have been the selected congregation space for various Muslim saints and scholars throughout the centuries. The ancient city of Fez houses within its walls an exquisite collection of monuments and sights that showcase the rich history and traditions of the Moroccan people. One of these monuments is Fondouk el-Nejjarine: an 18th century roadside inn transformed into a museum dedicated to the wooden arts and crafts typical of Morocco. The city of Fez in Morocco is one of the best known cities of Morocco with a very long and storied history. Some visitors may use Fez as a home base during a trip you take to Morocco, but others stick around long enough to explore some of what it has to offer. If you only have 24 hours to spend in the city, here are a few ways to spend the day. Start your day off right by indulging in a traditional Moroccan breakfast. Most hotels and guesthouses offer breakfast, however, if this isn’t the case for you, visit a bakery and pick up a krachel, bghrir or croissant with milky Moroccan coffee. A smaller, more compact city than Tangier or Marrakesh, Fez packs a lot of charm and history into its winding alleys. Fez el Djedid is the modern portion of the city, but most interesting things to see are located in the medina: Fez el Bali. For the past 18 years, the city of Fez, Morocco, has put on the Festival of World Sacred Music, dedicated to the traditions of knowledge, art and spirituality of the city. It began as a peace initiative following the first Gulf War but has since become an established part of the world music and art scene. This year’s event runs from June 8-16 at different venues in the city of Fez. The theme is “Re-enchanting the World,” and pays tribute to Persian poet Omar Khayyam. 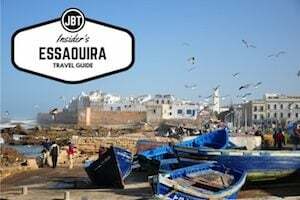 For traveling to Morocco, the ancient city of Fez and its medina can feel very foreign indeed. The walkways wind up and down through the hilly city, too narrow for cars or all but the slimmest carts and carriages. The medina is much like it was hundreds of years ago; the pace and structure of life still follow the old rhythms. You can feel the age of the medina—and its history—with each step. Nowhere is this truer than in Fez’s tanneries. The tanneries of Fez, holdovers from medieval times, produce much of the city’s renowned leather. Few who visit a tannery are left underwhelmed. The sight of dozens of men, many waist deep in dyes, working at a trade few outside this world could see, is a sight to behold. Fez’s tanneries are spread out like a tray of watercolors. Deep vats hold dyes in an array of colors and shades, each manned by a single tanner. Taking the raw leather into the vat, the tanners stomp on the hides, working them underfoot for hours until they are soft and pliable, and have taken on the desired color. Fez (also known as Fes) will charm you with its culture tucked into every tightly woven street corner, but it can be nice to escape—even when you’re enjoying this fascinating old city. If you’re aching to break through the city walls for a day, we’ve got you covered. Located in the Middle Atlas Mountains, Fez serves as Morocco’s cultural and religious center. The stark contrast between the old city’s narrow lanes, where donkeys barely have enough clearance to pass pedestrians, and the Ville Nouvelle’s wide, tree-lined streets is striking for many travelers, and it is this juxtaposition of medieval and modern that makes Fez one of Morocco’s top tourist destinations. If you enjoy the adventure of getting lost in a whimsical destination, Fez el Bali should be right up your alley…literally. Known for its seemingly infinite winding alleyways, Fez’s old town allows you to experience ancient Morocco with its well-preserved historical character. Wandering through the city’s narrow walkways is like embarking on a journey as far back as the ninth century, shortly after Arabs arrived in the country. Although demoted from the position of Morocco’s capital city, there is little doubt that Morocco’s former capital, the city of Fez, remains one of the most important cities in the entire country. Fez was the capital of Morocco for over four centuries, and it still remains the cultural center of the country, as well as one of the most important religious centers. The city was founded in the late 8th century, and a large part of Fez remains a medieval city in design, a visual proof of the city’s history and culture. On our Morocco photos, you’ll be able to see why Fez is a must stop. Fez is intriguing, its old buildings reflecting an architecture most of the world moved past centuries ago, with winding narrow streets that are too small to allow for common automobiles. This means you will see throngs of people on foot, and the streets are full of donkeys and mules, just as they were hundreds of years ago. The city is the cutting edge of Moroccan art and culture, yet with the same feel and similar appearance that maintained itself centuries before the first Europeans even appeared. One of the most tempting sites to visit is the Kairouine Mosque—which has stood for over 1,000 years. The Kairouine Mosque is considered the most important mosque and Islamic learning center in all of Morocco. Because of tradition, non-Muslims are not allowed inside, but there are open doors that you are allowed to look through, so long as you are respectful about it. Even glancing down these hallways gives you a sense of how much the building has expanded from a humble building to the giant center it is today. Even though the Kairouine Mosque is off limits to most travelers, several of the Islamic schools that are around the mosque do allow visitors. Many of these schools are literally hundreds of years old and contain beautiful courtyards led to through open doors rich in detailed work, using everything from marble to cedar. Unusually close by to this area is the tanners’ quarter, where you can visit and watch experts craftsmen apply their trades. A large part of the charm of Fez is that sense of a different time. While you will see all the evidence of modern cultural influence from blue jeans to boom boxes to modern goods, a traveler can not shake that sense of the past, from the narrow streets, to the buildings of old stone and wood, palaces and Islamic schools with elaborate entrances, to all the various sights that remind one of the past from ramparts, balconies, and courtyards to the walls that were once used for defense, before the need was no longer there and the city grew out towards the desert beyond them. Many of the streets are virtual mazes of alleys and tunnels, and streets are made of cobblestone. The voices of people—from old men, to merchants, to children—envelope the city, and it’s not far off description to describe Fez as a giant human beehive. Fez is a city where the modern culture and wonders lives among buildings and streets that speak about centuries worth of experience and history never forgotten. Travelers who are looking to stay in any number of Fez Riads can experience the city and medina like no one else. The culmination of these two meetings makes Fez, Morocco, a popular stop even for many travelers who are less inclined towards normal tourist spots or city seeing. Many of Morocco’s most renowned cultural festivities, from film festivals to art and music festivals, occur in Fez and often times bring travelers from all across the nation and beyond. Though no longer the official capital of Morocco, Fez more than holds its own among many fine cities and destinations for visitors, whether it be tourist or traveler. A unique, ancient, and appealing city, the Fez Medina in Morocco holds true to its definition that it once was a non-European city in Africa or the Middle East. In Morocco, medina simply means “city”. And, Fez has two: the Fes-el-Djedid (new), built in the 14th century and Fez-el-Bali (old), which was built towards the end of the late eighth century. Built by the first Muslim Dynasty, the Idrissids, the renowned medina sits on the banks of the Fez River. Locals claim that the Kairouiyine Mosque, constructed during the reign of Yahya ibn Muhammed, is one of the oldest in Africa. In 859, the University of Karueein, as it is now called, was officially founded, giving the Fez Medina one of the oldest universities in the world.